The following article is from a publication called "Where to Buy - Yeovil" published in 1890. 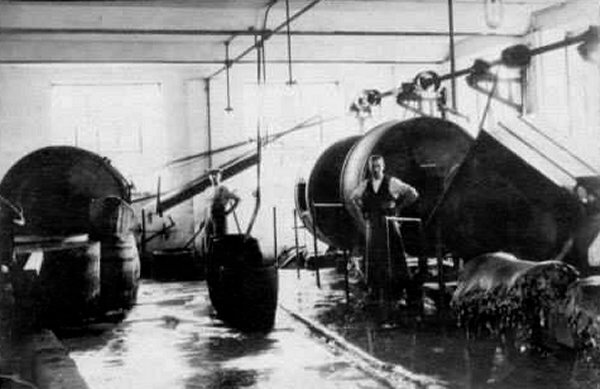 Although which factory under discussion is not made clear, it is thought to be that on the corner of Eastland Road and Reckleford. 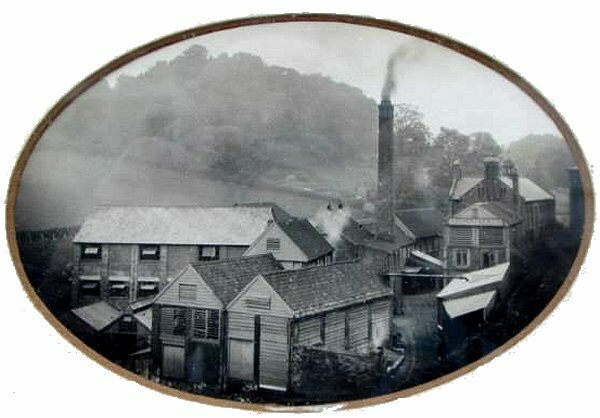 "The works which we were permitted to inspect our on the outskirts of Yeovil and our extensive and distinctly representative of the perfection to which this particular manufacture has been bought in modern times. 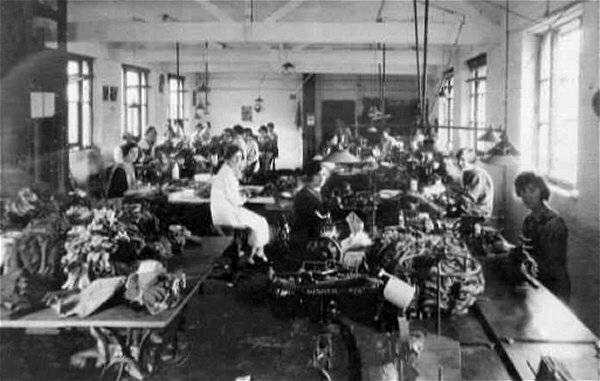 The works consist of two separate departments, viz., the building where the raw hides dressed before going to the glove maker, and the glove factory proper, which is a spacious and handsome edifice in which the prepared leather or skin is finally turned into finished goods. 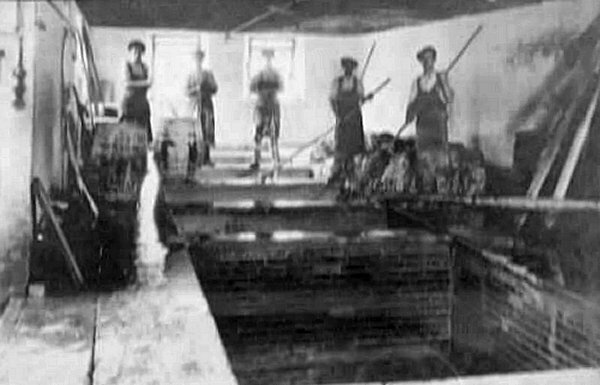 The hides, which are principally lamb and kids skins from Russia, Spain, Italy and Persia, are, in the first instance, taken in their raw states and with the wall on, to the skin room preparatory to being transferred to another large room, on the floor of which they are spread out to dry. The wall is then separated from the hide by chemical process, and has no further use in the factory, it is sold as it is. The hides are next scraped and placed in large tumblers containing alum and salt, with which are mixed immense quantities of the yoke of eggs. From these tumblers the skins go to the vats, here to be drenched with the preparation technically known as 'pure', and are steeped in a mixture of meal and water, which gives them softness, pliability and face. After this they are dried, which operation is carried on in the open air when the weather permits, or in large steam-heated drying rooms. They are next beaten in stocks to soften them, and are laid by in a store-room upstairs for about three months. When they have remained here long enough (and the longer the better) they are sorted into different species and qualities. This finishes the preparatory process. The glove-maker's art is then called into requisition. 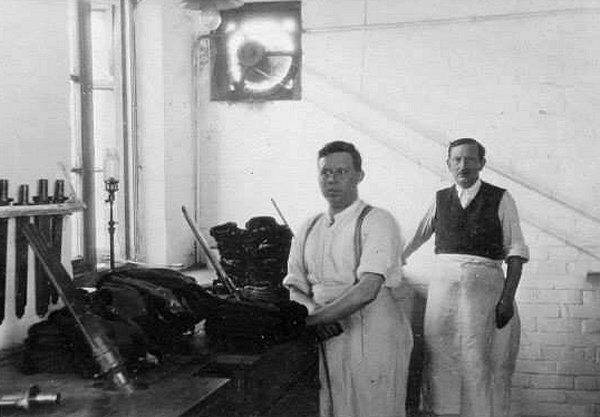 Having entered the glove factory proper, the skins are washed in a bath of alum and salt, and then dried either in the open air or in artificially-heated rooms, of which latter there are four in the factory. When thoroughly free from moisture they are bathed in yoke of eggs, sorted and taken to the dying rooms, where the various shades of colour are imparted to them. 30 different dyes are used in the factory, all of which are produced from vegetables, no mineral being employed. A little aniline is occasionally added. 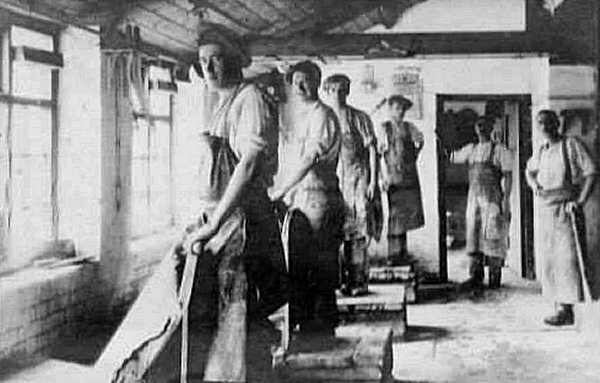 After being again dried they are once more slaked to stretch them, and shaved or planed to render them of uniform thickness. This finishes the preparation, and they are now ready for being 'tranked', or cut into shapes by machinery. 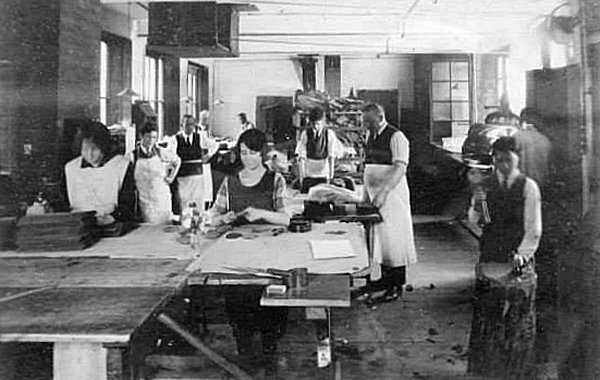 The palms and thumbs are stamped out with dyes made for the purpose, and then separated, the back being stamped with holes for stitching the three rims of silk on the outside, ot 'tambouring', as it is called, and all the pieces are handed over to girls, who stitch up the fingers and the button-holes with the aid of sewing machines. Latterly it has become fashionable to wear fur on winter gloves, and in the factory under notice a large fur department, in which may be seen whole furs of beavers, opossums, sables, and seals, as well as rabbit and hare skins, which are dyed in imitation. 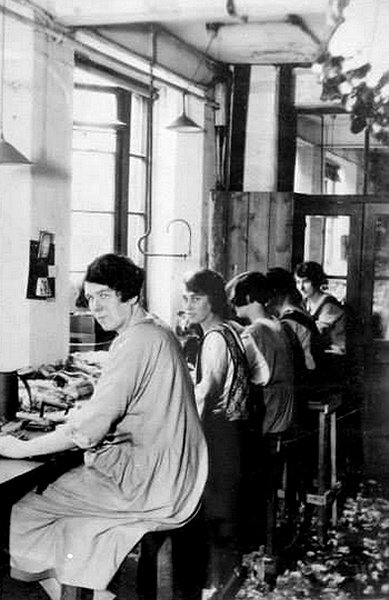 The fur is added to the gloves on the premises, and gauntlets for ladies gloves also form an important branch of the work. Cape driving gloves are very fashionable just now, and are being made here very extensively. It is strange to note the difference between the relative popularity of the different colours. Drab is by far the most popular shade, six different degrees being sent out. The finest skins are prepared in the shade. Gentlemen, however, show a great partiality for brown. 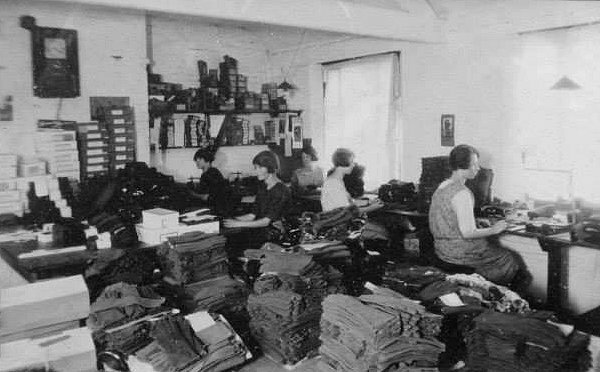 The quantities of gloves sent out from this one manufactory is simply surprising, and the quality is equal to the very best in the markets of the world, whether in regard to material, finish, or style." 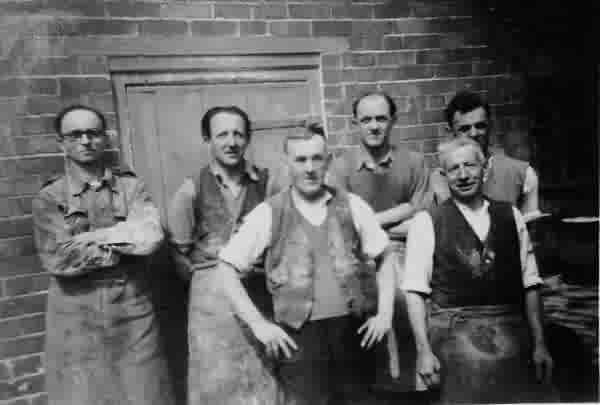 This photograph is thought to be Yeovil leather dressers of Whitby Brothers Ltd. John Allen (1890-1951), from Vincent Street, is front right. 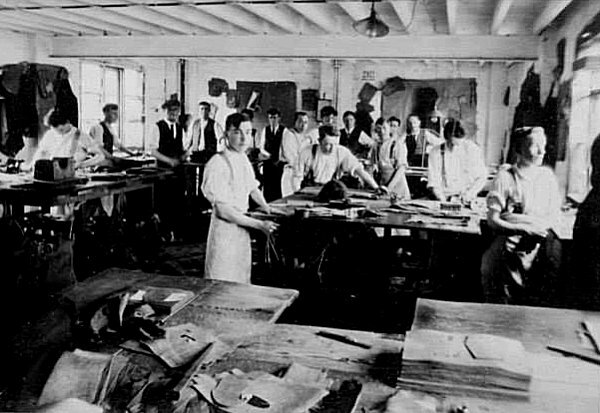 The following collection of photographs are courtesy of Roger McElliott and show the various departments of Clothier, Giles & Co in the 1930s. 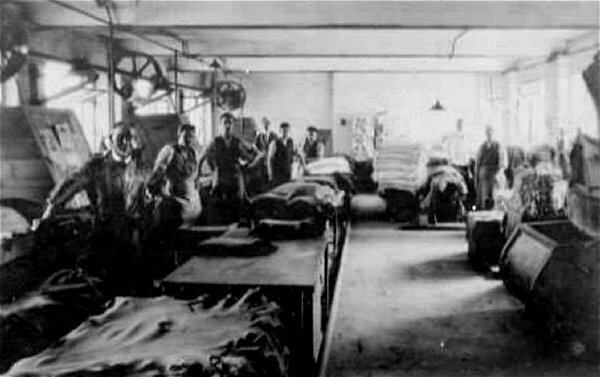 General view of the leather dressing yard and glove factory. 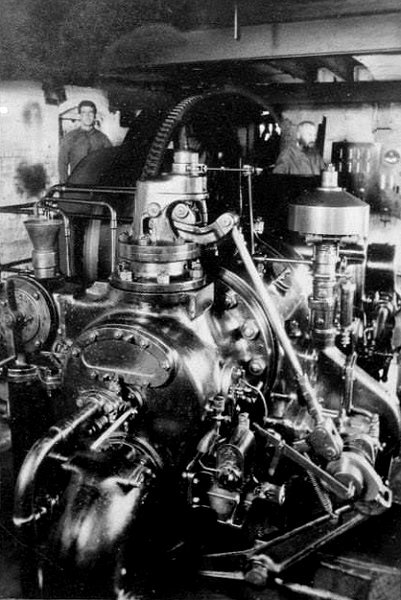 The engine and electrical plant. The webbing and counting room. The banding and boxing department.